PenDelfin Pooch Dog designed by Doreen Noel Roberts. 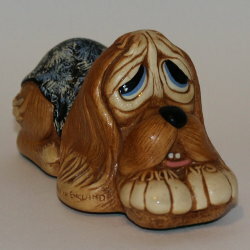 The PenDelfin Pooch was produced by the PenDelfin Studios in England from c1962 until he was retired from production in c1987. This is a lovely example of the PenDelfin dog Pooch as he is wearing a really patterned and eye-catching blanket. 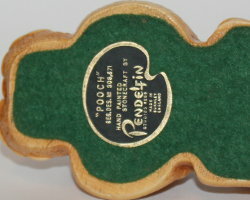 On his base this PenDelfin dog has his green felt and PenDelfin artist palette, Pooch, label. Condition: Excellent overall condition. 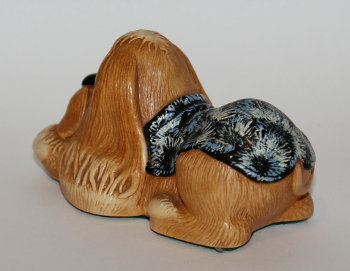 A lovely early PenDelfin dog in an unusual colourway.